In game design, the enemies that you create might in some cases be more important than the player character. Right now me and a team of five other people are developing a game based on a game concept someone else created. The game is called Umibozu, and you play as a curious fisherman trying to find the mystical creature called Umibozu. Lost in a dense fog you have to avoid obstacles, pick up energy crates to keep your floodlight running, and shoot down any vicious sea creatures trying to bring you down to the ocean floor. The concept document we were given described most of the mechanics necessary to create the type of experience we are after. However, it only describes that there is supposed to be enemies attacking you. It doesn't describe exactly what the enemies do. This meant that it was up to me and my team to design the enemies. We all agreed that one enemy should just be trying to ram you. It is easy to implement and adds stress and time pressure to the player. We then felt like we needed to come up with one or two other types of enemies in order to make the gameplay more varied. A few months before this project, the team I'm a part of participated in a workshop about a concept called orthogonal unit differentiation, or O.U.D.. The workshop was based on a presentation by Harvey Smith from 2003. It can be found here. The point of this workshop was to show how giving different units different abilities is an inexpensive way to add depth in gameplay. 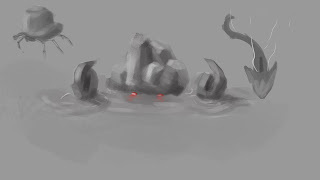 For example, creating a second enemy that also rams the player ship doesn't really add anything new to our game. It does the same thing as the first enemy, but it requires us to create a new sprite and animation, which in the end gives us little gameplay improvement for the time invested. This why we set about to create enemies that created new gameplay opportunities. 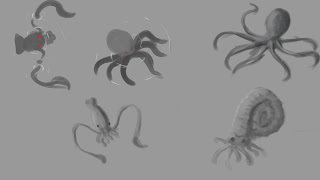 After some brainstorming we ended up with a couple of different ideas for how these new enemies could behave. Our most popular ideas was to have one enemy throw projectiles that you could avoid, and another that hid next to rocks and other obstacles and ambushed the players' boat if it got to close. The problem was that we didn't really know what kind of creatures would fit with these abilities. The ramming enemy would work great as a shark that swims towards you. Our new enemies weren't as straightforward. This is where my role as an artist came in to play. I started creating concept images of different creatures that could possess the abilities we wanted. The original concept document showed a giant squid as a possible enemy, which I felt would work great for our projectile throwing enemy. It could try and hit the player ship with one of its' two long tentacles, or it could throw ink which blocks the players' vision. Whilst not fully realistic it could definitely be believed in a computer game. The third enemy was a bit trickier. We couldn't come up with any real sea creature that would fit the bill as something hiding next to rock. I then recalled seeing crabs and other crustaceans with rocky formations as the top part of their shell in other games. Shamelessly using these games as references I started creating my own versions. All the art is created in Adobe Photoshop CC 2015. Using wither a hard round brush, or a custom textured brush I first blocked in the general shape with big strokes, adding a few layers of shading and lighting on top of it in order to define the shape more properly. Since the point of these concept images was to provide our group with different ideas for later discussion the art isn't very polished. Spending a bit more time on them would improve the quality of them, but that time would be better spent doing something else. That's all for this time, Esbjörn out! The author has shown the material taught in lectures (orthogonal unit differentiation) and how they and their team has applied in in their development process. They have displayed the task given to them by their group and how they tackled it. When talking about the creative process when it came to creating the concept art, the author chose to take a more generalized approach where anybody, regardless of knowledge, could have a reasonable grasp of what is going on. This is just observation and choosing to be more technical or more general is down to the preference of the author. Aside from a minor typo or two, the author’s English is clear in both spelling and grammar. I feel like I do now have some insight into the process of both the author and their group. One thing does strike me as odd though. While the author wrote about fighting off marine life with a sea monster inspired by Japanese mythology as the boss, at no point did I see them mention either marine life or Japanese mythology as areas of research, just games. As a fellow Graphics minor, I am always curious about every decision in the creative process and I feel myself and the audience would have a better grasp of said process if more mentions of research were included.